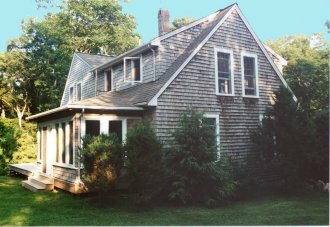 ADDRESS: 65 Christiantown Road, West Tisbury, Martha's Vineyard, Massachusetts, USA. Our house this year is the Nancy Edwards house. From VINEYARD HAVEN FERRY, leave the ferry and take a LEFT. Proceed to the right lane, where upon passing the A&P store, turn RIGHT at the stop sign. Follow South Main Street out of town, where the road becomes State Road. Drive about 5.3 miles. You will pass the main road of Lower Lambert's Cove Road. At the "Y" intersection of State Road and Old County Road, turn RIGHT. You will pass Upper Lambert's Cove Road. Just AFTER Upper Lambert's Cove Road you will come to another "Y" in the road (just before Up-island Cronig's Market). Take the RIGHT branch, which is Indian Hill Road. Take a RIGHT at the first intersection (a bunch of mailboxes are along with right side of the road), which is Christiantown Road, and drive on a sand/dirt road about 7/8ths of a mile (you will pass a small Mayhew Chapel). At the fork in the road (one fork goes straight, the other fork goes left), bear LEFT. The HOUSE is at the first drive on the RIGHT. 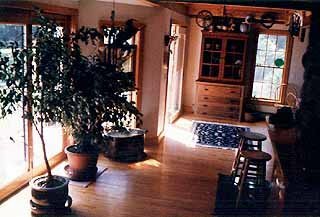 There are 10-foot cedar trees in the front yard, a small ridge in the road, and the house appears through the trees. From MARTHA'S VINEYARD AIRPORT, drive south out of the main entrance/exit and turn RIGHT onto Edgartown Road. Drive about 3.9 miles to the town of West Tisbury. At the "triangle" intersection with South Road, turn RIGHT onto South Road (going north). Drive about 1.4 miles to the "Y" intersection of North Road and State Road. Turn RIGHT onto State Road. I'd estimate that within 1 mile, turn LEFT onto Christiantown Road (there is a sign for "Christiantown Road"). Drive on a sand/dirt road about 7/8ths of a mile (you will pass the small Mayhew Chapel). At the fork in the road (one fork goes straight, the other fork goes left), bear LEFT. The HOUSE is at the first drive on the RIGHT. There are 10-foot cedar trees in the front yard, a small ridge in the road, and the house appears through the trees. The four interior pictures shown below are courtesy of Nancy Edwards, the owner of the house. The Edward house as seen from the back yard. 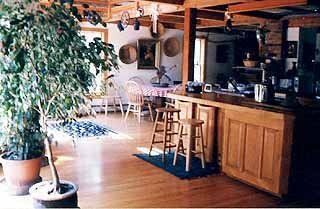 The house is a 5 bedroom, 3 bath, 3,500 square foot post-and-beam home located in Christiantown, on the North Shore of West Tisbury. It's an excellent location, being 5 minutes to Lambert's Big Plants Cove Beach, 10 minutes to the South Shore beaches, and 15 minutes to the fishing village of Menemsha. 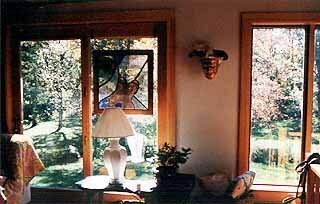 The house is located on 5 1/2 acres boarded by a sheep farm and stone walls with huge oak trees. It is an "extremely" charming house set in a very quiet atmosphere. 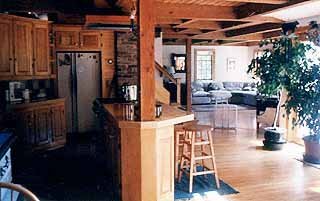 The home is furnished with Island artist work and antiques, contains 5 queen-size beds and one twin bed, 1 large TV on the main (second) floor, and a small TV on the first (ground) floor, stereo, VCR, and cable TV. There is an open kitchen-and-living-room plan, with a fully loaded gourmet kitchen (including dishwasher and microwave) plus a vegetable herb garden outside the kitchen door. The third floor contains a fully booked library, with a possible office set-up. The main (second) floor has its own very private setting - - living room area, TV, fireplace, bedroom & bath. The house has 2 full outside decks, one to the front of the house and one in the back of house (including outdoor furniture). Also included is a new gas grill, (very pleasant) outdoor shower, washer and dryer, and bed linens and bath towels. This home is in pristine condition. The owner request "No pets, please" and adds that the home is "never a disappointment!!!". 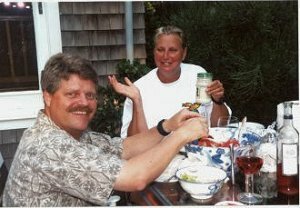 Master "grilled chicken" chief Bob is seen relaxing with Sheila while eating lobster and drinking white merlot wine. Earlier Bob prepared us a delicious serving of his chicken on the grill. Cronig's grocery store was only about a mile from the house. The well-stocked grocery store provided us with our food for the trip. We forgot, however, that it's a "dry" store and had to buy our wine at Our Market on the harbor at Oak Bluffs. 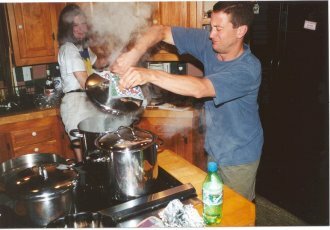 Tom C lights the stove in preparation for a steam bath by our friends the lobsters. Many of us arrived by airplane out of the Martha's Vineyard airport. Cape Air flies from Boston, Hyannis, Nantucket, and New Bedford. US Airways Express also offer year-round service from Hyannis, Nantucket, and New York City, and season service from Washington DC. El Lardo, master chief "Dr. Chris", has arrived after an extended tour of Africa, along with Mary Beth, to treat us to his special touch of lobster, corn-on-the-cob, rice, and other tasty delights. Laura looks on, hoping to get a free sauna from El Lardo's side business, combining healthy cooking and saunas for a double delight. Bill even had time to visit the West Tisbury public library, that is located across from Alley's general store, and write a computer science article on his laptop. Joining El Lardo is Dan and Nancy, obviously entranced with his cooking techniques and formulas! We expect the glass of wine (in the foreground) has added to El Lardo's descriptive behavior. The tour of the lighthouse of Aquinnah was very interesting as we climbed the steps into the "light" of the lighthouse. 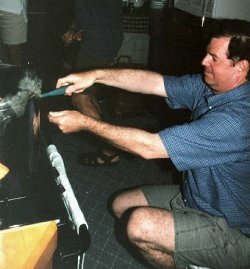 Bill stumped the volunteer when he asked: why are lighthouses built round? Possible answers could be to minimize the force of winds or to save on the amount of building materials. Does anyone know the real answer? Our cars are prepared for traveling around the island. Several of us enjoyed the Farmers' Market at the Grange Hall in the town of West Tisbury. With Alley's general store, town hall, Congregational Church, Music Street, and Grange Hall all in a row, this town is often compared to an old New England village. The Donaroma's Garden Center on Upper Main Street of Edgartown provided us with plenty of flowers and shrubs to look over as we explored the area outside Edgartown. Edgartown was named in 1671 for the young heir presumptive to the English throne, Edgar, the only surviving son of the then Duke of York, the eventual King James. Maureen was so sorry to read that there are slow children all over Martha's Vineyard. 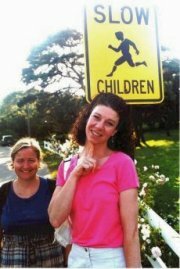 Nancy soon finds that extremely intelligent children also inhabit the island as we stop by a "lemonade stand" operated by up-and-coming businesspersons. Many of us enjoyed the Lambert's Cove Beach just a bike ride from the house. We received our walk-on beach pass from the old firehouse on Old Courthouse Road just down the road from Humphrey's (great for pastries and sandwiches). 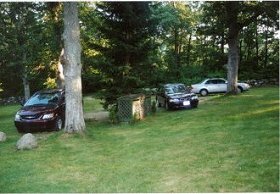 Jennifer enjoyed her stay at the Lambert's Cove Country Inn, located on Lambert's Cove Road in West Tisbury. The quiet, secluded 1790 inn is set on 7.5 acres of spacious lawns with gardens. 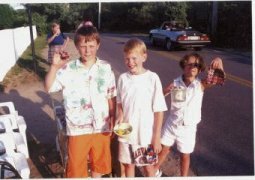 Young businesspersons are highlighted in this photograph after being given "expert" help from world-renowned business consultant Bill, suggesting they call the newspaper next time they set up the stand asking for a frontpage story and photograph of their business. 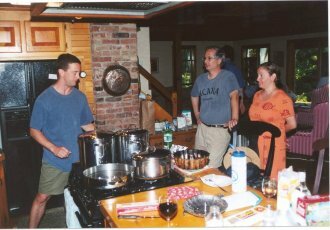 The Polly Hill Arboretum on State road in West Tisbury presented "Field Day" on June 24, 2001. At the festivities many of us saw the Kids' Scavenger Hunt, the Flying Elbows Contra-dance, and tours of the gardens of azaleas, camellias, viburnums, lilacs, crabapples, magnolias, and rhododendrons, among others. Maureen and I talked with Mrs. Hill who, in her 90s, rides the grounds in her golf cart. The fudge was especially good: well, "one" person could say that! This living museum is the home to a unique collection of more than 1,600 kinds of plants on 60 acres of natural Vineyard beauty and tranquility. 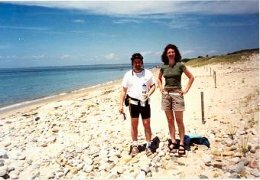 Tom P and Maureen stand on the beach inside Cedar Tree Neck Sanctuary. 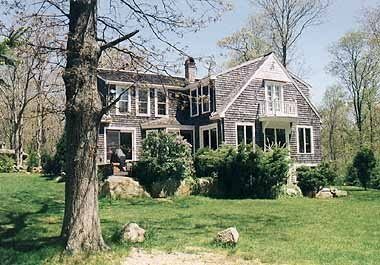 The area provides excellent examples of the habitats and vistas that make Martha's Vineyard such a special place. An easy walk took us through tall oaks until we dropped down to the sandy beach. As we entered the hiking path we saw the freshwater Ames Pond, rocky cliffs, shrubs, ferns, and beech groves. We found that bicycling on the numerous bike paths and back roads is one of the most enjoyable ways to explore the many areas of Martha's Vineyard. 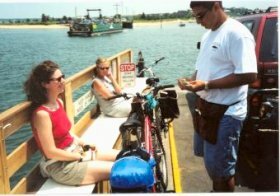 Maureen and Bill walk their bikes onto the Chappy ferry after riding from the house, through Old Stage Road, to the bike route circling the state forest and the MV airport. Then, the pair rode off to Edgartown, riding through the town on Main Street, onto North Water Street, passing The Daggett House, and to the ferry for Chappaquiddick Island. While on the island they passed the Chappaquiddick Beach Club with its charming cabanas. They visited the Mytoi Japanese Gardens for a quick lunch and a quiet stroll to view the beautiful trees and flowers. Later, they biked to the Dike Bridge that was rebuilt and reopened in 1996 after being closed for numerous years (if you know what I mean). Further along the road they stopped at Wasque Point (along Katama Bay) and a walk along the beach. We biked about 38 miles, but that's an approximation after I hit loose sand and dumped the bike; resulting in the odometer quitting on me, along with the front brakes. We also shopped for about an hour or so after circling and identifying the most interesting dress shops in downtown Edgartown. 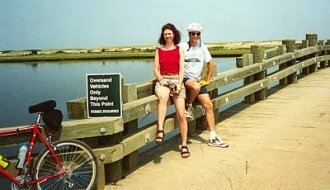 A bicycle trip through Chappaquiddick and Martha's Vineyard is a great way to spend a spring afternoon. 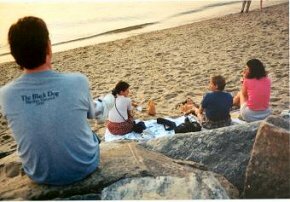 A sunset at the Menemsha public beach in the fishing village of Menemsha is enjoyed by Laura, Nancy, Maureen, Bill, and Tom C. (after securing a very difficult to find parking space). It is appropriate that Menemsha is translated as "the place of observation" in reference to Prospect Hill. The gentle surf of Vineyard Sound and the great sunset made this a favorite event of the trip. Dinner was provided by the seafood place along the curve in the road leading to Menemsha. (Does anyone remember the name of the place??) ..... Laura informs me that the name of the restaurent is the Bites Cafe...... Menemsha is known as an artist's paradise with its lobster pots, nets, rigging, and other gear used in Vineyard fishing. It is also a working fishing villege as fishing boats dock and unload their catch at the fish markets. Bob and Sheila enjoyed their several visits to the restaurant Expresso Love, with its home baked cakes, pies, muffins, croissants, scones, desserts of all kinds, and (from what was advertised) the best coffee on the Island. 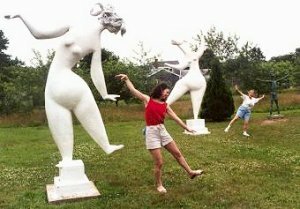 Nancy and Maureen pose at the Field Gallery, an outdoor sculpure garden and indoor gallery of original paintings, photography, and ceramics along State Road at the West Tisbury Center. Many in the group discovered a great restaurant in Edgartown called Lattanzi's. Albert Lattanzi opened the restaurant in 1994 and continues to bring the Vineyard the wealth of tastes that Mr. Lattanzi dicovered during his extensive travels to Italy. 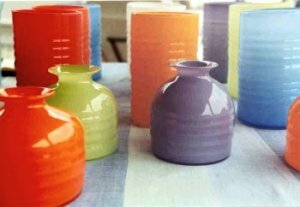 While walking around at the Farmers Market in West Tisbury, Bill discovered a vase display from Vineyard Vases by artist Nan Bacon. She can be contacted at Post Office Box 2901, Oak Bluffs, MA 02557, 508-693-1857. Bullwinkle knows that "V" stands for "Vineyard"